— Legal firm “chooses anonymity to allow it to make the maximum contribution” to the RSA and the Rules of the Road. — RSA gets interpretation of traffic law from legal firm which defends civil road traffic insurance claims for multinational insurers. Legal advice received by the Road Safety Authority relating to keeping motorists out of cycle lanes is “commercially sensitive”, the authority claimed when rejecting a Freedom of Information request on the issue. As we reported recently, the Road Safety Authority (RSA) told IrishCycle.com that there is “legal ambiguity around whether the law could be effectively enforced” in cases where a motorist enters a cycle lane marked with a solid white line (legally known as a mandtory cycle track). The claim that there is ambiguity was made public after the Advertising Standards Authority of Ireland failed to act on complaints about a KBC Bank advertisement which depicts a taxi driven into and blocking a cycle lane on the busy Ranelagh Road in Dublin. The advertising standards body said it was following advice from the RSA. The letter said that the firm do not act for plaintiffs, but act for and are retained under contract by multinational insurers…”. Email from Road Safety Authority to Legal Firm on 23rd May 2013 @13.27, seeking legal advice in relation to Taxis stopping in cycle lane. This is not being released under Section 36 (b) of the Freedom of Information Act 2014 ‘Commercially Sensitive Information’. 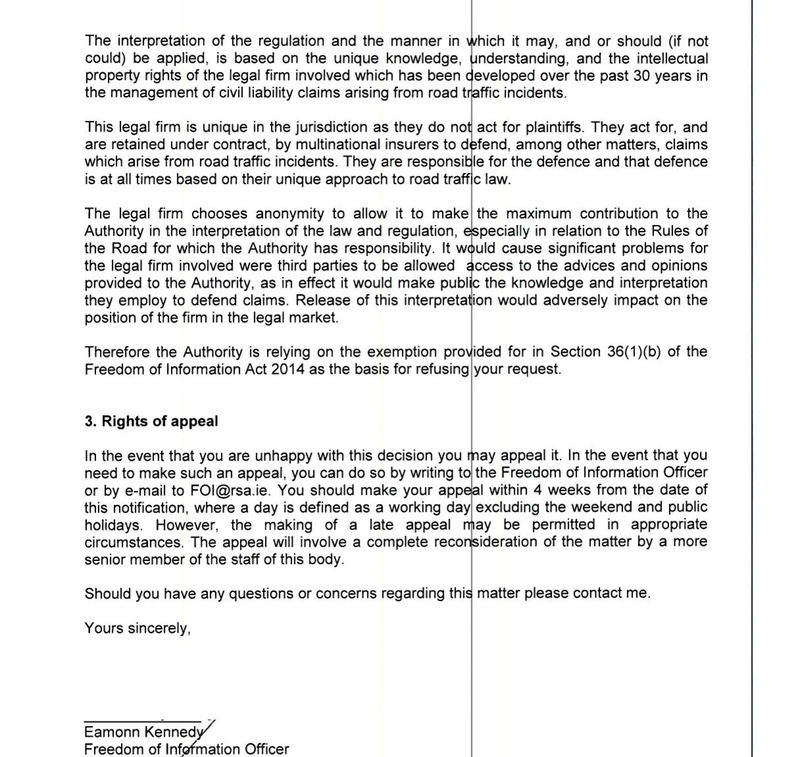 Email from Legal Firm to Road Safety Authority on Monday 10th June 2013 @ 18.41 outlining legal advice in relation to Taxis stopping in cycle lane. 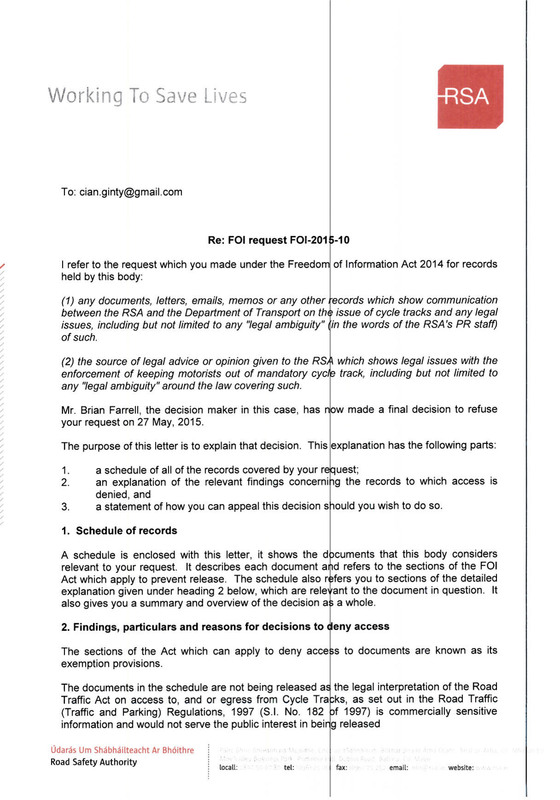 Internal RSA email Monday 10th June @ 19.48 sharing legal advice in relation to Taxis stopping in cycle lane. I think a question to the minister of justice asking if the legislation is really ambiguous is in order. Of course the only way to really find out is to take it to court, perhaps someone from the RSA or their secret law firm would volunteer to be charged? I’d also be interested to know if there are any other traffic laws that the RSA have been advised are ambiguous. Maybe we don’t really have to indicate when turning, or obey the speed limit, or stop for red lights. Again, as I said that last time this came up, how is it that they can’t criticise blocking a cycle lane because the law may not really say what it clearly appears to say but they can criticise showing cyclists without helmets which is clearly and unambiguously legal. I’m intrigued now. “legal ambiguity around whether the law could be effectively enforced”: I had assumed they meant the law in practice was too cumbersome to enforce, too widely violated to be meaningfully policed, or that the Gardai were insufficiently interested, but this seems to imply that the wording of the Statutory Instrument is deficient, or that it clashes with another Statutory Instrument. If the fault is with the SI itself, surely they can just say how it is deficient? What’s commercially sensitive about that? Perhaps you could meet them in a parking garage under cover of night (you could dispense with hi-viz for this once) and list possible sources of ambiguity and they could nod when you get to the right one. If this is the advice that the RSA have been given (and appear to have accepted), perhaps the RSA would be able to release information on what steps they have taken to have this ambiguity resolved. Given that this is a law clearly intended by the Oireachtas to improve safety for cyclists on the roads, I’d presume that resolving an ambiguity that is frustrating that intention would come within the remit of the RSA. For example, have they made representations to any Departments or other public bodies about this supposed ambiguity? Given that the DoT’s position flatly contradicts their own, has the RSA discussed that disagreement with the DoT? Have they discussed enforcement of this particular law with the Gardaí? If the Road Safety Authority is content to let an apparent ambiguity around cyclists’ safety on the roads stand, or it they just haven’t done anything to try to resolve it, perhaps they could release their own reasoning for that inaction. So are we to understand that the RSA takes its primary advice on matters of road traffic legislation from advisers whose usual role would be to reduce the financial impact of claims on their clients (i.e. insurance companies)?